Do you love Fantasy? Steampunk? Post Apocalyptic? What about westerns or coming of age stories? Oh! and a bit of romance with a dash of family saga angst? 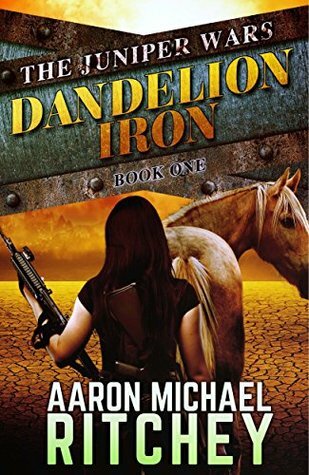 Aaron Michael Ritchey’s new novel Dandelion Iron gives you all that and more. It’s a steam powered adrenaline race through the tech devouring landscape of the Juniper with a cattle drive that encompass highways and dirigible pirates, love and sacrifice and the bond of sisters. I NEED the sequel. If you’re up for a mind bending ride that makes you imagine trying to survive in this possible future- pick up book 1 in The Juniper Wars and hold on tight. It is the year 2058. The Sino-American War has decimated several generations of men, and the Sterility Epidemic has made 90% of the surviving males sterile. Electricity does not function in five western states. Colorado, New Mexico, Utah, Wyoming, and Montana are territories once again. Collectively, they are known as the Juniper. It is the most dangerous place on Earth. On a desperate post-apocalyptic cattle drive to save their family ranch, Cavatica Weller and her two gunslinging sisters stumble across a rare boy. Sharlotte wants to send him away, Wren wants to sell him…and Cavatica falls in love with him. Little do they know that an inhuman army is searching for the boy and will stop at nothing to find him. Welcome to the world of The Juniper Wars.